In this blog, we will go over when a compression connection valve is used, the options you have when picking your compression connection valve, and the steps needed to properly install a compression connection valve in a sump pump, effluent or sewage system. A compression connection is used to join a valve to IPS (Iron Pipe Size) piping and it provides a means to connect a PVC valve to PVC piping without the use of primer and solvent cement. 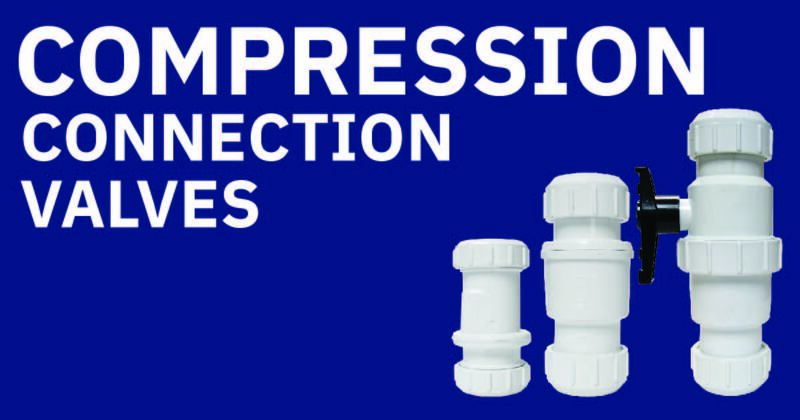 Compression connections also allow for the joining of two dissimilar materials with the IPS outside diameters. Making a watertight seal requires the compression nut to be tightened to compress the gasket to seal against the pipe. A PVC Swing Check Valves which provide reliable back flow protection, along with a designed angle seat to minimizes flow reversal, and potentially damaging hydraulic shock. Set with this knowledge you are now ready to go through the steps to complete a compression connection for your sump pump system. #2 - Clean both pipe-ends and slip sockets of the valve. #4 - Remove the compression nuts by turning counter clockwise, remove the compression gaskets. #5 - Slide the inlet compression nut followed by the gasket over the discharge pipe from the pump until it covers the marking from step 3, slide the valve body onto the discharge pipe until it bottoms out. Ensure the flow arrow is pointing away from the pump. Then slide the compression nut and gasket towards the valve body and hand tighten the compression nut. Best practice is to install valves in the VERTICAL position when pumping solid­ free liquids. #6 - Slide the outlet compression nut followed by the gasket onto the discharge pipe from the check valve until it covers the marking from step 3, position the discharge pipe into the valve body ensuring it bottoms out. Then slide the compression nut and gasket towards the valve body and hand tighten the compression nut. #7 - Double check the markings on the pipe (Step 3) are flush with the ends of the compression nuts. #8 - Tighten the compression nuts 3/4 to 1 turn with a spanner wrench or strap wrench. Average torque should be approximately 25-foot pounds for valves up to 2” in size. #9 - Properly support and restrain discharge piping, the pipeline must be restrained to prevent lateral movement by end blocking at direction changes and at any reduction in pipe size. #10 - TEST your connection to ensure a leak-free seal.